My apologies for not posting the second installment of Alternatives to Clickers for Digital Assessments last week. It is my goal to post each Tuesday night and then the TechToolThursdays on…well, Thursdays. Since I missed last week, I will post two times tonight in order to stay on my schedule. This post will focus on using the online and app-based tool, Socrative, as an alternative to clickers for digital assessments. 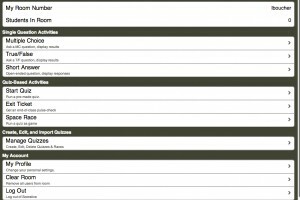 Socrative is a free web-based tool that allows teachers to either create quizzes and assessments before-hand, or deliver single formative assessment questions “on the fly”. Students complete the assessment on any web-enabled device. Do your students have iPads or Android devices? Great! There are teacher and student apps for both! Registration for Socrative is easy and FREE! Once you are registered, you are given a classroom number. This number is what your students will use to join your class and take your assessments. Your class number will be the same each time, however, if you want something a little more personal you can change your class number from your “Profile” menu. 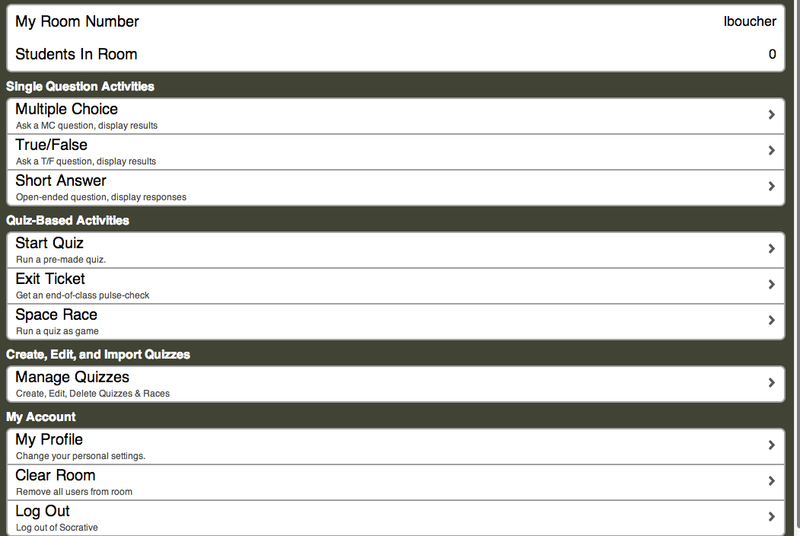 Here is a screenshot of what your teacher dashboard will look like in Socrative. I love Socrative for its variety of question and quiz types. Question options include multiple choice, true/false, and short answer. 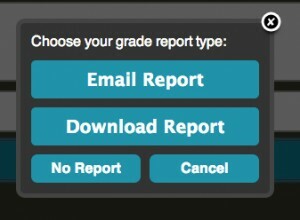 Before delivering a quiz, you can choose for it to be student paced or teacher paced. You also have the option to randomize answer choices, disable immediate feedback, and hide any question explanations. Quizzes can be shared between teachers, which can increase collaboration within your PLCs. Once your students have completed a quiz, you are given several options for reviewing results. The reports are delivered in the form of a color-coded spreadsheet that breaks the assessment down question by question, student by student. 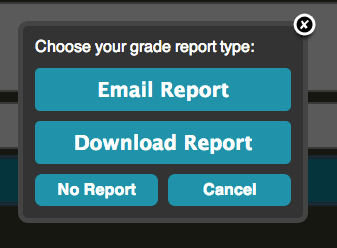 In addition to quizzes, Socrative features a couple of assessment features that are very useful. The first is the Exit Ticket. This is a quiz that includes the same questions each time, so you just launch it and go. The questions are: “How well did you understand today’s material? What did you learn today? Please solve the problem on the board.” Obviously if you’re going to use the Exit Ticket, you’ll want to have some kind of problem on the board. 🙂 The second feature is called the Space Race. This is a game that puts your students onto teams. You can let them choose teams or allow the program to choose for them. Students then race to answer questions. Each correct answer moves the team’s spaceship across the screen. The first team that reaches the other side wins, but the game doesn’t stop until all spaceships have crossed the board. This game also generates a report for the teacher. One powerful way to use Socrative is to set up “template assessments”. Similar to Socrative’s Exit Ticket, these are generic assessments that you can use over and over again. Check out the three “Thinking Routine” templates that were shared on the Socrative Garden blog on January 27, 2014. Are you already using Socrative? Please share your experiences in the comments below. Check out other posts in the “Alternatives to Clickers for Digital Assessments” series.